A prosthodontist specializes in restoration. They dedicate years to learning how the oral structures work together to create a harmonious and comfortable bite. They also study the art and science of creating tooth replacement options that offer natural function and an attractive appearance. 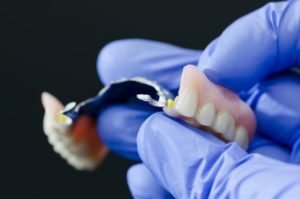 It is true that many general dentists are able to design high-quality prostheses to replace their patients’ missing teeth. Some of them have even undergone advanced training that equips them to perform various restorative procedures with skill and finesse. However, that does not make them “prosthodontists.” They may not be qualified to handle extremely complex cases, which is why many general dentists often have to refer patients to prosthodontists. A true prosthodontist completes three years of extra training after dental school. Then, they must pass a rigorous, four-part examination administered by the American Board of Prosthodontists. When you visit someone who has completed all of this training, you can rest assured that you are receiving the top-quality restorative care that you deserve. The advanced knowledge that a prosthodontist acquires also equips them to handle cases that go beyond prosthetics. For example, because they are so intimately acquainted with the way the jaw and facial muscles function, they may be able to help you find relief from temporomandibular joint disorder (TMD), as well as sleep disorders like sleep apnea. In cases where multiple and complex issues exist, a prosthodontist may team up with other specialists and your general dentist in order to ensure that your treatment progresses as smoothly as possible. Often, a prosthodontist serves as the leader of such teams. Prosthodontists are dental specialists who go far above and beyond the basics of dentistry. If you need complex restorative work done, find one of these talented professionals in your area. Dr. Benjamin Geller is a board-certified prosthodontist who is a Fellow of the American Board of Prosthodontists and a member of the American College of Prosthodontists. Working alongside Dr. Gloria Garcia-Geller, he is able to meet the needs of the vast majority of patients who come into our office. If you are interested in learning how the team in our practice may be able to restore your smile, contact us at 323-467-1472.